If you open up a watch or a clock, you can see the MOVEMENT that makes it work. The equivalent in a piano is the ACTION, and it was the invention and development of that action that made the piano what it is today, and distinguished it from all other keyboard instruments. A typical piano action has about 340 main moving parts in addition to the keys, but if you break them down into every separate component of wood, felt, baize, pins, wire etc., there are thousands of parts to an action. Many of those parts may seem to be mass-produced, and look the same on every note, but some change through the range of the notes, and a lot of skilled hand work is required in making or servicing them. Let’s suppose that you want to create a mechanical device that will strike a string when you press a key. You will find that the type of material that you use to strike the string will have a great effect on the tonal quality, which is also affected by the point where you hit the string along its length. The key moves in a simple see-saw motion, so the rear end of it rises, and the simplest thing to do is let the key itself strike the string, as it does in some toy pianos. No piano action can work efficiently if the keys are not moving correctly and freely. Alternatively, the key can use a device called a MOPSTICK to push a little hammer towards the string, as it does in a simple square piano. Once the hammer has struck the string, there is a very brief moment when they are still in contact, and the position, shape and surface texture of the hammer has a great effect on the tonal quality by muting some harmonics. Then, the hammer has to escape very quickly from that position, otherwise it will block the string’s vibration entirely, and the note will not sound properly. This BLOCKING is usually overcome by adding something called an ESCAPEMENT or SET-OFF which stops pushing the hammer before it reaches the string, and allows it to ESCAPE the control of the key. Then, the hammer will SET OFF on its own for the rest of its journey without being controlled by the key. Having struck the string for that moment that is so critical to tonal quality, the hammer immediately bounces off it. The next problem is that if left unchecked, the hammer may bounce back to strike the string several times, an effect known as BUBBLING. (It’s onomatopoeia, if you sing the word “bubbling” on one note, you imitate the effect.) To stop this happening, a device called a CHECK is needed, to catch the hammer and hold it until you release the note. This means that the over-used term CHECK ACTION is virtually meaningless, piano actions cannot operate efficiently without checks, so saying a piano action has checks is a bit like saying “car, with wheels”. Finally, when you release the key, a soft felt pad called a DAMPER stops the string vibrating. It is at this point that most pianos have the option of holding all the dampers off the strings by pressing a pedal, so that the note you just played can SUSTAIN and continue to fade away slowly, while you play other notes. This means that the piano can sound as many notes as you can manage to play before they start decaying (fading away). Although it would be possible to build this pedal arrangement into a harpsichord, I have never heard of one single example, and the sustaining pedal remains an important feature and characteristic of the piano, sometimes said to be “the soul of the piano”. Cristofori was the first to develop an action in this way, but various pretenders claimed the invention of the piano, and were probably blissfully unaware of Cristofori’s existence. He had defined all the requirements for the action that was so vital to the piano, and after he died in 1731, Gottfried Silbermann must have made or procured detailed drawings of Cristofori’s action, because he copied it faithfully. Despite suggestions that German makers produced a quite independent design known as “The German Action”, it is obvious when you look at photos that he was so impressed by Cristofori’s invention, he made something that was not different, not similar, but IDENTICAL. Over the years, many people, books and websites have stated that the German Action was the same as the Viennese Action, but this is certainly not true of Silbermann’s, and I would love to hear from anyone who has hands-on experience of working on a German piano equipped with the “German Action”. Most examples described as having a “German Action” online are actually Viennese. Although Austrian people are often described as “Germans”, Austria has not always been part of Germany, and it is not now. 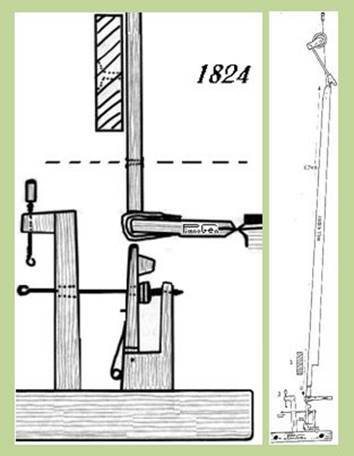 The diagram on your left was kindly sent to me by Erards, and shows their 1821 patent for a grand action which was so successful, it has become the basis of almost all modern grand actions, but there are many examples on the internet of the wrong Erard diagrams being attributed to 1821. The middle picture is a slightly improved Erard from Tomlinson’s 1853 Cyclopaedia. On your right, we see Kaps’ version of the Erard action, from about 1875. Instead of a hammer rest rail running right across the action, each note of this one has a separate hammer rest. Although there are many different types of action, there are only a limited number of ways to arrange the working parts of a note inside a piano. The keyboard needs to be at a convenient sitting height above the knees, so that is a fairly constant factor around which other parts are arranged. In the simplified diagrams below, we see the main configurations for the relative positions of the keys, hammers and strings in different types of piano. G is the normal configuration for Grand and Square Pianos. V is the Viennese fortepiano configuration, the hammer reversed. O is “Over-Struck”, better known as Downstriking, the hammer and strings being below the keys. U is an Upright Grand in the original sense, with the strings above the keys. N is the normal upright piano configuration, with strings using the full height. H is Horsburgh’s little upright piano of 1786, strings below the keys. M is the origin of the Minipiano by Lundholm, 1931, strings below the keys. P is Pape’s 1839 Piano Console, the hammer mounted slightly below the key. 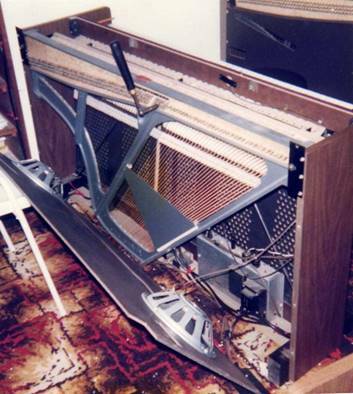 D is a Drop Action, (or front-lift) used in small upright pianos, “dropped” down below the keys. 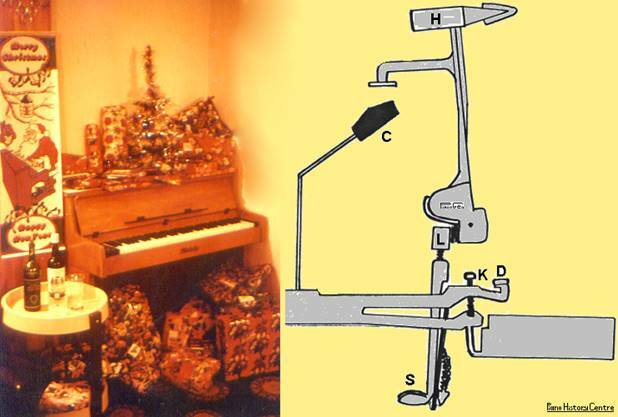 B is the Baldwin Electropiano, the hammer hanging upside-down below the key. In piano books and other reference sources, there is a tendency to talk at great length about grand piano actions, and square piano actions. Very little information is published about the many types of upright piano action, so I have taken a special interest in collecting diagrams of these over the years, and attempting to provide some form of classification for the actions of what, after all, are the most common types of piano. 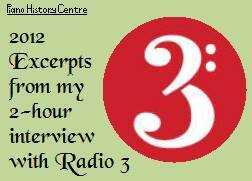 The following is a selection of what I hope are the more interesting ones, and their main purpose here is that they may provide clues to the age of the piano. Most are drawn from the actual parts. By the 1830s, actions tended to be made by separate specialist firms, but where the action maker is unknown, I will try instead to give the name of the piano. The descriptions here refer to the parts of a single note, but every note in a piano works in a similar way, except that pianos rarely have dampers on the top notes. For the sake of uniformity, all the actions are viewed from the right or treble end. Dates quoted here are usually from known examples, rather than indicating when the design or patent was introduced. Some French pianinos, such as Bord’s, and most old British and German upright pianos, and some London ones as late as the 1950s, have OVERDAMPERS – mounted on a wooden rail above the hammers, and connected by over sixty vertical wire rods which lead some American authors to call them “birdcage actions” – a term of abuse. There are some small differences between the designs of overdampers which can sometimes define them as English, German, or vaguely “Continental”. In particular, the wires on German overdampers are hinged in such a way that they cannot usually be lifted to the vertical position, which is a nuisance when one is servicing them. After the 1914 war, there was a propaganda story in the English piano trade that these were specially designed to poke out the eyes of the English workers! Some upright pianos were made around 1900 which had overdampers in the bass section in addition to underdampers throughout, in an attempt to improve damping for the more massive strings in the bass. Examples include F.Weber. 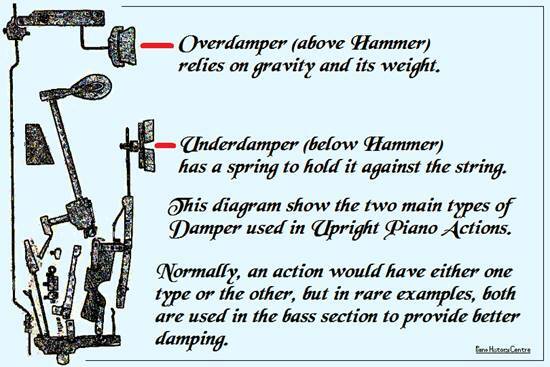 Dampers in grand pianos and square pianos can be positioned above or below the strings, so there is an argument for also calling these OVERDAMPER or UNDERDAMPER, but those terms are more often reserved for uprights, and over is the norm for them anyway. By the late 1700s, most English pianos of any type had a device on the back end of each key, which pushed the hammer towards the strings. We know from original labels that some makers called these STICKERS. The following item shows that Longman referred to “the sticker fixt in the key”. 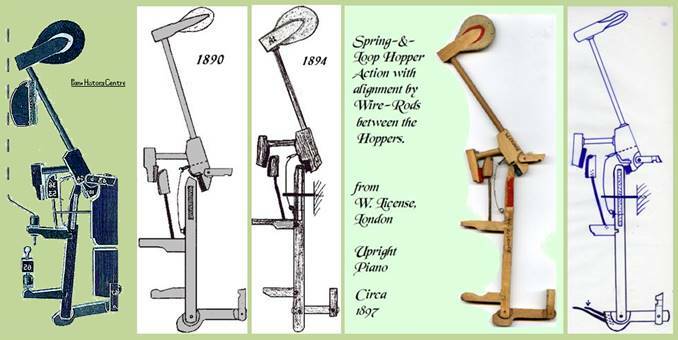 Others called them JACKS, [lifting devices] or HOPPERS, [hop up and down] or simply LEVERS, but “STICKER” is a more specific term that separates them from other types of action, and it appears that Southwell was the first to use it in upright pianos. Adjustment is made by means of a screw which runs through the sticker, and has a felt-covered SET-OFF button on it. In taller upright pianos, the hammers were a long way above the keys, and long sticks, like the ABSTRACTS in organ actions, were used to connect the stickers to the hammers. In later times, these sticks have come to be known as stickers, but that was not the original meaning of the term, and they did not exist when the term was first used. If you google “English Sticker Action”, don’t take too seriously what you read there! The vast majority of Victorian English Cottage Pianos have virtually the same type of sticker action, often made for them by Brooks & Co., London. 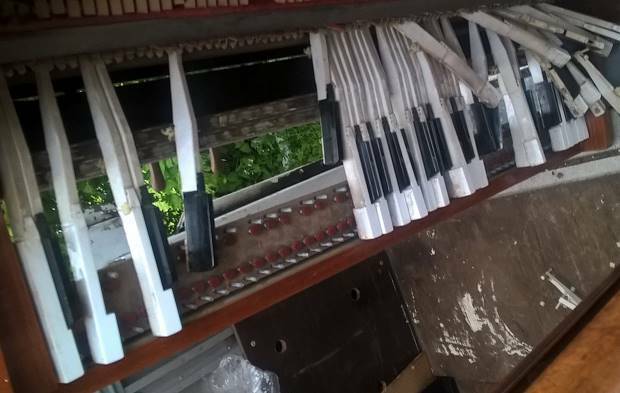 The system using tapes or ties to help the hammers return was patented by Robert Wornum, London, in 1826, for his “Piccolo Piano-Fortes”, despite suggestions that Lichtenthal invented this in 1831. It has overtaken all other types to become the basis for all modern upright pianos. We have examples of Wornum’s pianos in our collection, and his own actions still work remarkably well after 160 years, although they look crude and hand-made by comparison with later machine-made competitors. After his death in 1852, the company continued to make the actions in almost identical form. Wornum called the tapes TIES, and this remains their name in the USA. Pape, Paris, copied Wornum’s action, and Schwander copied and developed Pape’s, the resulting action sometimes being known as a “French Check Action”. The London firms continued to ignore Wornum’s idea, sticking with stickers, but by 1848, Broadwood was making a model which copied the French Pianinos, complete with the “French” action – basically Wornum’s! In these, the tie was a loop of cord, with a kind of slip knot. John Isaac Hawkins, London inventor, made at least 2 small underdamper upright pianos around 1801 in which the sticker acted directly on the hammer. One is now in the Smithsonian, another was auctioned, having been in the Broadwood Collection. In Paris, 1837, Henri Pape adapted the sticker action in a simple yet novel way, by curving the end of the key downwards, so that the sticker was below the level of the key, allowing a lower height for the whole instrument. The whole action and keys slide out, as they do on a grand. Our collection includes 2 examples of these. The whole keyboard slides out with the action attached to it, as in a grand. Removing the action from the keyboard involves 8 screws and 3 sizes of screwdriver. The keyframe layout is fairly normal, but the bat-pins are narrower, and each key has a tiny screw in each side to adjust the tightness of the key against the pins. There are no bushings in the keys, but tiny pieces of leather are used to prtest the ends of the screws. The front rail pins do not have separate baize washers, there is a sheet of baize all along the keyboard, which has to be punched with holes at precise points to align with the pins. Even at this early date, Hawkins and Pape had quite sensibly placed the damper below the hammer – UNDERDAMPER. Bord’s Pianinos and most German uprights tended to follow the English way, and persisted with OVERDAMPERS for a long time. Being so close to the top ends of the strings, overdampers never stop the strings very efficiently, and no amount of repair will fix this, it has to be regarded as a part of the original character of the instrument. It doesn’t make the piano unplayable, it just means a note will not always stop so efficiently when it is released. Some tuners use this an excuse to write off perfectly playable pianos. This detail from an 1824 Wornum Professional Pianoforte in the Mobbs Collection has been reconstructed on the right to give some impression of scale, but in this very tall Cabinet Piano, the hammer is a very long way above the sticker. There is a piece missing from this action, a rail I have represented at the top of the diagram, which may have connected somehow with the adjustment screw below it. A bushed horizontal hole in the abstract suggests that perhaps there was a wire spring there, represented by the broken line, but its function is not clear. 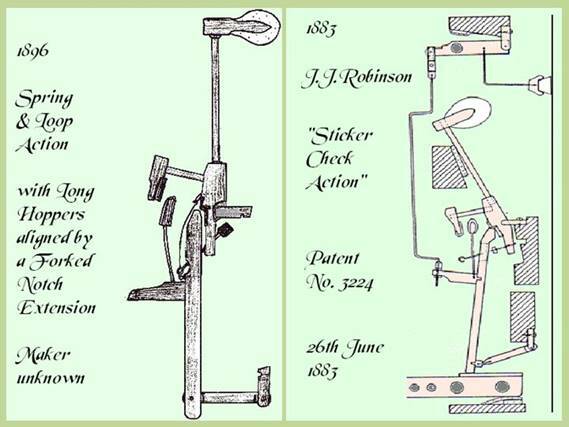 Robert Wornum was one early maker who experimented with extra adjustment devices on and around the sticker. I think it is fair to say that Wornum’s casework designs were very plain, he was a functional person rather than artistic. Having said that, his candleboards are functionally the worst I have ever seen! 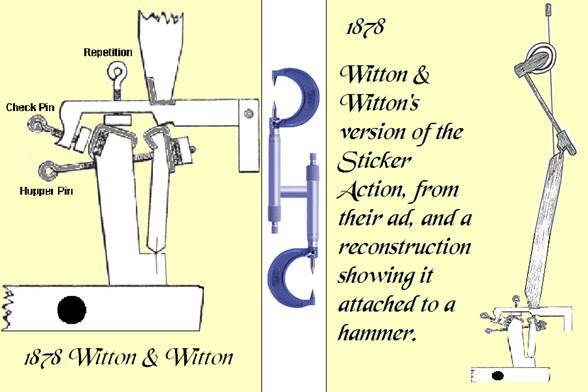 Around 1857, H.M. Oughton was also using a sticker action with extra buttons on the stickers for lost motion adjustment. 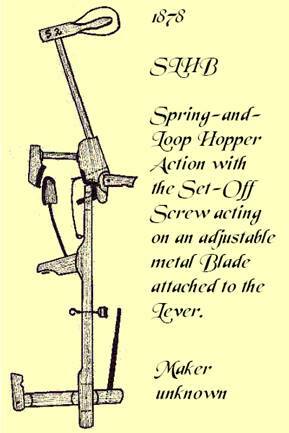 This diagram was advertised by Witton & Witton in 1878, with the addition of adjusting screws, labelled as Repetition, Check Pin, and Hopper Pin. The Check Pin is intended to grab the abstract from below, and provide some means of checking the hammer's movement after it strikes the string. The Hopper Pin is simply the usual set-off screw for the sticker. The Repetition screw took up any LOST MOTION (slack play) between the key and the action. The reconstruction on the right shows how it might have looked in an action. 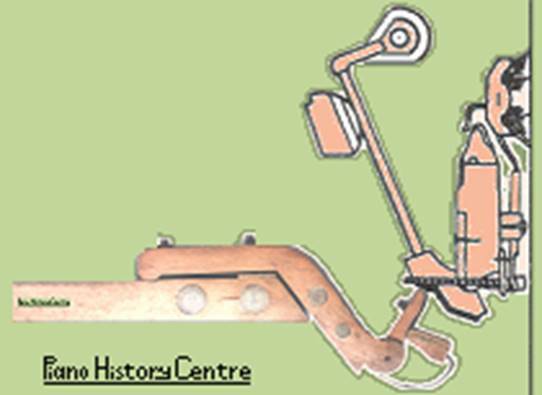 One of the practical problems for repairers is the fact that whereas modern piano hammers are individually swivelled on flanges with CENTRE PINS, sticker actions often have large groups of hammers swivelled on one continuous CENTRE WIRE, a major nuisance when it comes to repairing just one note. Nowadays, we are most familiar with what are known as TAPE CHECK ACTIONS, in which a cotton tape (or something similar) is used to encourage the hammer to return to its rest position after the key is released. (The term CHECK ACTION is only relevant when compared to actions which have no check to catch the hammer after it strikes.) Upright piano hammers operate in an almost horizontal direction, and do not get much help from gravity, so the tape gives a little more encouragement to bring the hammer away from the string after it strikes. SOBR means Set Off on the Beam Rail. Wornum put the set-off screws on the rear of the action, sticking through the beam-rail to act on the jacks, as they do in Schwechten’s version, on your left here, but this means that the action has to be removed in order to adjust the screws, so some makers veered away from this arrangement, and put the set-off screws into the jacks, acting on the beam-rail, and easier to adjust from the front, hence the term “Front Escapement”. The second diagram shows an 1879 Schwander action, then we see Kirkman’s 1882 action, then Broadwoods’, used in almost identical form from at least 1865 to 1884. Godfrey Twitchen told me about his 1878 Broadwood, which has a similar action, but with underdampers, probably one of the earliest that Broadwood used, although the overdamper version was still being produced in the 1880s. Don’t bother trying to understand this transfer, it is virtually meaningless, most pianos had check actions, and FRONT ESCAPEMENT is one of many examples where piano makers found a more impressive way of saying “normal”. Later, these actions of the 1890s, by Schwander, and by Morgenstern & Kotrade, use set-off buttons that are mounted on a rail, and act downwards on the jacks, directly above the springs. This is the same method used today, and produces a more pronounced swivelling motion on the jack, allowing it to escape further from the notch in the hammer. 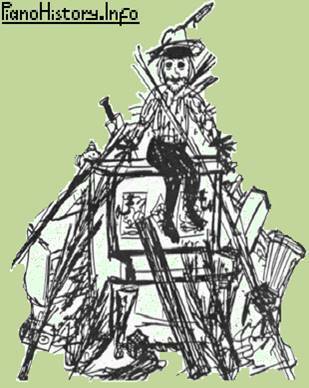 The little Schwander version was used in some late Cottage Pianos. 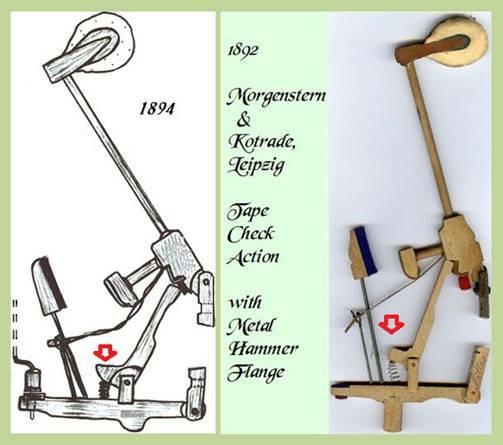 The example on the left, made by Gehrling in 1890, has the tape passing through a staple on the underside of the balance hammer. 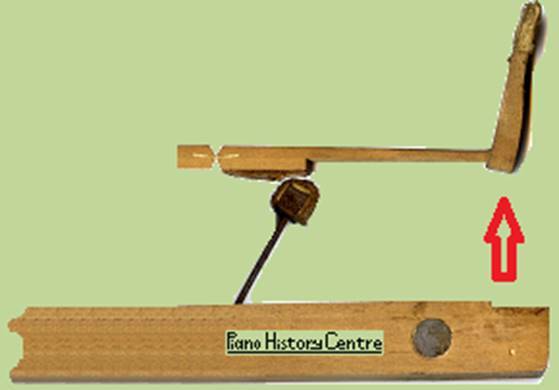 Later versions, spread through the 1900s, have a hole in the wood of the balance hammer, with the Tape Through the Balance Hammer, an idea that was more common in Canada and the USA. The second action is an American one by Strauch, 1891, with a simple extension device called a prolonge underneath, to make it taller. The next is by Berden, Belgium, 1880. 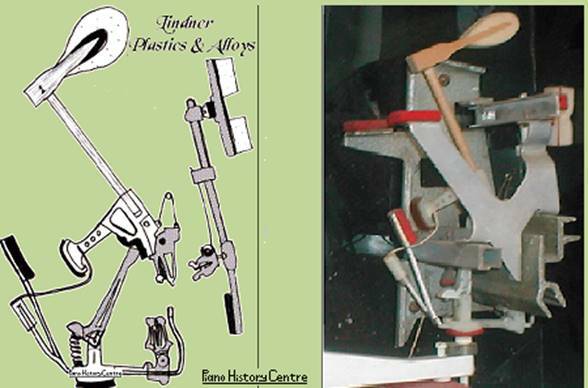 The TTBH action from a 1906 Collard & Collard piano also has the balance hammer curved inwards acting on an extra repetition spring at the top of the jack. Modern Baldwin pianos have the tape through the balance hammer, and when I worked for them, they said they had prosecuted a Chinese firm for copying the arrangement. In the twenties, Stener made TTBH actions with a double jack, [right] one acting on the hammer, the other acting on the check. 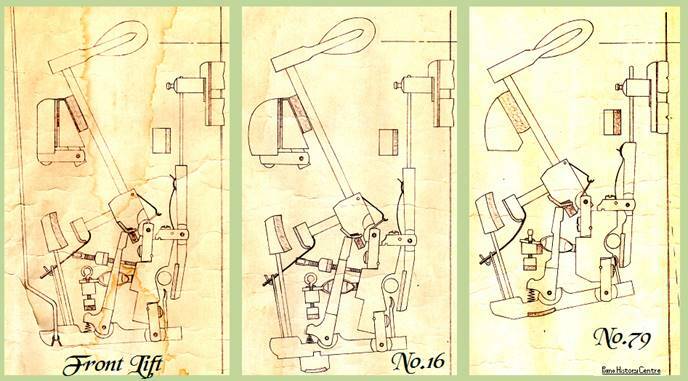 Here are some of Herrburger Brooks Limited’s own technical drawings of their actions, courtesy of David Taylor. These three are very similar, but No.79 is smaller, and “Front Lift” is their own quite logical term for what most tradesmen call a DROP ACTION, “dropped” down behind the keys, lifted by a wire rod attached to the key. 1963 Lindner tape check underdamper upright action. Apart from the damper felt, hammer head and shank, it is made of plastic and metal: the flanges have spring clips onto the beam, instead of being screwed. The lever is cut from a flat piece of alloy, bent to form the check wire, bridle wire, damper spoon, and tabs bent upwards to support the jack flange. Sadly, plastic parts tend to break in these modern yet obsolete pianos. 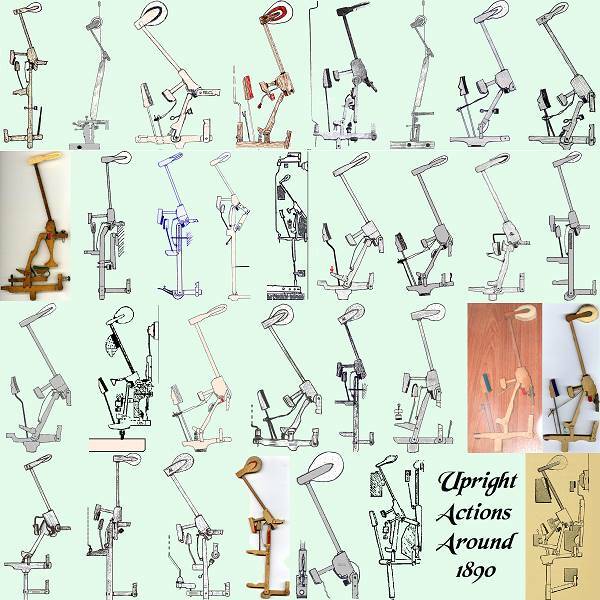 Despite appearances, Lindner’s action is closely based on Wornum’s 1826 design, and it can be adjusted by following his original instructions from a century-and-a-half earlier. We have a 1973 Lindner, kindly donated by Sherwood Phoenix Pianos, the most modern piano in our time-line, and when it was moved here, it provided an amusing example of the way the plastic keys break! An alternative to using a tape or tie is a wire spring, hooked into a loop of cord. When these have short jacks, rather like those used in tape actions, the types can often be defined in terms of the position of the loop in relation to the jack. 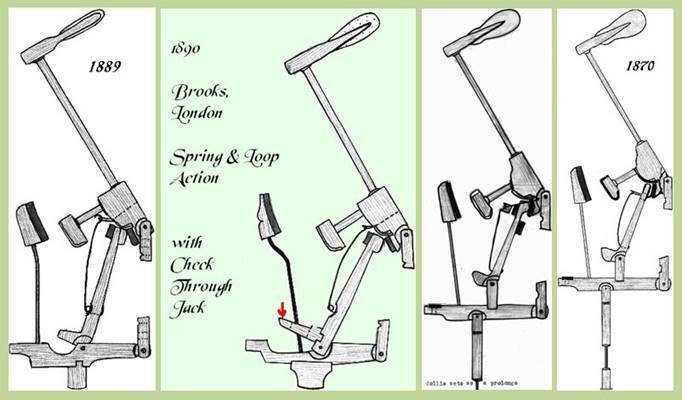 SLO means the spring-and-loop goes Over the top of the jack. The 1889 example here is from a Brinsmead piano. SLO – CTJ is similar, but with the Check wire Through the Jack, as it was in some early Erard tape actions. This example is by Brooks, London, 1890. 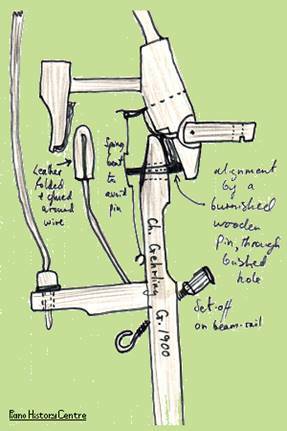 SLA means the loop goes Around the jack, an idea developed by Brinsmeads, who fitted a wooden block onto the spring, to hold the loop clear of the sides of the jack. Similar actions were used in some of their grands. 1906 Broadwood upright tape check action with the addition of a Spring-and-Loop Through the jack. The spring has an adjustment screw in the jack. Streich did something similar n 1910. Examples of Langer actions on similar principles include Broadwood 1908, Cramer 1916, Bechstein 1898 & 1924. Older people in the piano trade, working on old pianos, refer to something they call a COSTA ACTION, but when challenged, they are unable to define exactly which types this does or does not include, or what the origin of the term is. There are confused references to names like Molineaux, Molineux or Molyneux in this connection: our research in Manchester about Thomas Molineux has provided some answers, and some of his pianos are labelled “Patent Self-Acting Escapement and Perfect Check Repeater Pianoforte Action”. His patent of 1862 is sometimes wrongly described as being French. It seems that Molineux did indeed invent what has come to be known as a “Costa Action” although the origin and meaning of that term remains a puzzle. Until his patent expired, it prevented other makers from using springs and loops in their actions. Then, Germany routinely exported cheap Costa actions to be used in many cheap London pianos, until the 1914 war. Makers included Isermann, Langer, Lexow, Morgenstern & Kotrade, Schutze & Freund, etc.. Some sources seem to separate the Costa from Molineux’s patent by phrases such as “Molyneux and Costa Actions”. In 1888, Ballingall offered pianos “with best French Check, or Molineux, or plain action”. “French Check” means the French version of Wornum’s Tape Check action. “Plain Action” means the English Sticker Action, which was still going strong in 1888. Old paperwork may refer to the term COSTA, but most does not seem to define, describe or illustrate the costa action. In general though, they seem to be talking about the following types, spring-and-loop actions with hoppers. These differ from jacks slightly, in that instead of swivelling, they mainly just hop up and down. I classify these actions as SLH – Spring & Loop with Hoppers. This example, used by Jenn Brothers, London, 1895, is very unusual in having underdampers. 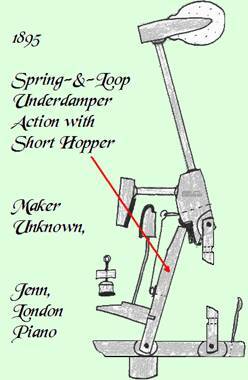 It also has quite a short hopper, and a similar Eavestaff action may be as late as 1922, but most others have hoppers which are much longer, and because of this, the hoppers can easily become misaligned with the hammers, so they need to have some kind of device to keep them in place: this device provides us with a means of classifying them. The set-off button often acts on these alignment devices. 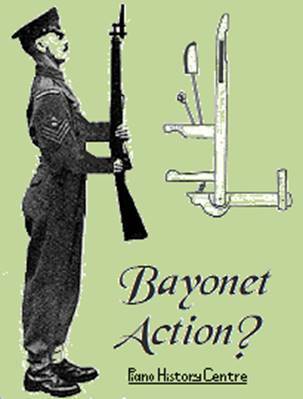 These actions may be what was known in France as a “Bayonet Action” (Mécanique baïonnette). It is not hard to picture the movement of some of the longer hoppers as a bayonet on a rifle held by two arms. However, some internet items refer to bayonet actions in pianos by Bord and Broadwood, both of whom used tape check actions. This may be just another case of websites talking rubbish, or I may be wrong in thinking that the term refers to costa actions. In both instances, the names were used, but not defined. The example on the left provides a rare definition from an old H.J.Fletcher catalogue (courtesy of Andrew Giller) and is described as a COSTA CHECK ACTION. John Spencer was using these in 1903, imported from Germany, and probably did so until the 1914 war. This, the most common type, has horizontal Wire rods between the hoppers, and these are cushioned by felt pads on the sides of the hoppers. 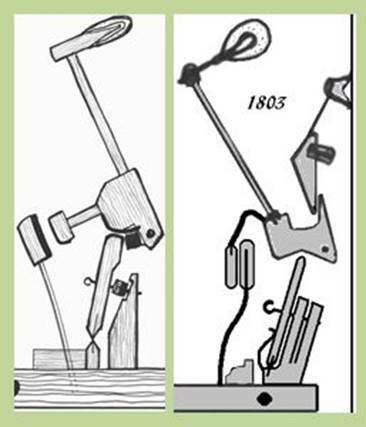 The example on the right, made by Langer, 1885, also has extra adjustment rods at the lower end. This has a forked extension coming down from the notch, which goes either side of the set-off button. Just to add to the confusion, the long hoppers are sometimes described as stickers! In 1883, Robinson called it a “Sticker Check Action” although it has no sticker in either sense of the word. This has a socket which receives the set-off button, and helps to keep the hopper aligned. The socket is attached to the same flange as the hammer, but at its lower end. Brinsmead used these around 1884, and their grands on a similar in principle around 1890 included some of their Top-Tuner grands. This has a metal blade behind the hopper, and the set-off button acts on it. Alignment is provided by a wooden pin which protrudes through the hopper from the notch. The Gehrling action on the right has a similar wooden pin through the top of the hopper. It was made around 1900. 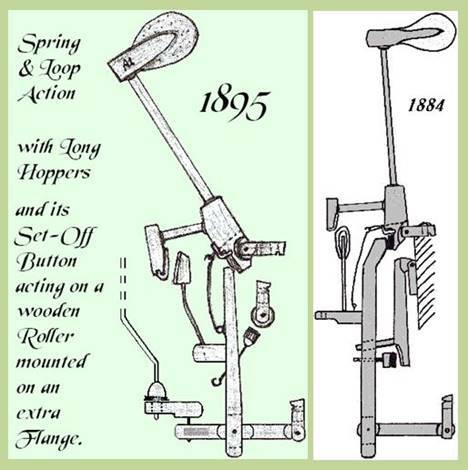 SLHP, the 1884 version on the right, was grandly described by the makers, Schwander, as THE VICTORIA ROLLER ESCAPEMENT CHECK ACTION, but its “roller” does not roll, it is a wooden pin on a separate flange, and it simply passes through the hopper to hold it in line. Again, the set-off button acts on it. There are some upright actions which do not have tapes, and yet do not fall into the normal spring and loop categories, so for want of a better name, this miscellaneous group are sometimes known as TAPELESS actions. In 1877, Schwander & Herrburger patented several upright check actions, all without tapes. The 1877 example above seems to have completely redesigned the normal parts, and shows great originality, but it did not survive. These are mainly found in Hopkinson pianos, but although the action maker’s name does not appear on them, they are almost identical to Herrburger-Schwander actions of 1883, as shown in the photo. The next example is from a Manuel, Sons & Co. piano of 1890, owned by Sherry Waring. A tapeless action from an 1895 Kenba yacht piano, sold by Barkers of Kensington, is similar, but with a prolonge to extend the height. Schwander’s action used in a 1895 Schwechten piano has the jack hooking into the notch, and also acting on the check. The jack in Eavestaff’s later action hooks in a similar way. An 1895 Yates upright piano has a tapeless action, which also has the notch extended to catch under the specially-shaped jack. The check is in the usual position of the balance hammer, and acts on the jack. A similar action was used in some Spencer pianos of the period, and by Moore & Moore around 1901. 1938 Tapeless underdamper action from Bristol Miniature piano has the damper on the same flange as the hammer. STAIB’s tapeless action works on a similar principle. The short-lived 1982 Baldwin Monarch has an upright drop action which is almost identical to a normal tape check action, but unusual in being without the tape. They took another company to court for copying this, but some technicians describe it as “a lack of an action”. This remarkably efficient little plastic upright underdamper action from the Electrokey electric piano, circa 1965, has the jack through the key, and the hammer strikes a metal reed instead of strings, which is amplified to produce a sound like a very sweet, elegant doorbell. The Horniman Museum has the J.L.Stephen Collection of piano action models, which may be available for anyone wanting to do further research. Without donations, I will be fine, but our collection may not survive. If every visitor to this site made a donation, we would be able to add more refinements and displays to our museum building, and much-improved facilities for research within our archives.